Enhancing customer service & care is a highly concern for all organization, they are striving to keep their customers satisfied & served, they try to improve the processes and systems to effectively serve them on good manner. KTC provide business suite for the customer services that helps the call centers, quality monitoring & assurance & customer services to better improve the relationship with the customer and extend a quality services all the time. 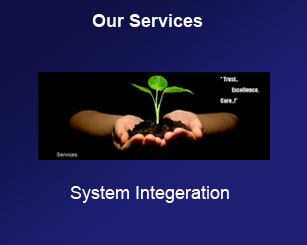 Our solutions help the customers to improve the quality of services by advancing the call centers, improve record & analyze the customer call, communicate with the customer all the time by sending SMS for any update & progress, using centralized fax server for receive & distribution and so many other advantages. KTC & Altitude Software the global leader in contact center technologies are delivering a unified customer interaction solution that recognizes the customer and intelligently applies consistent business rules across all channels. 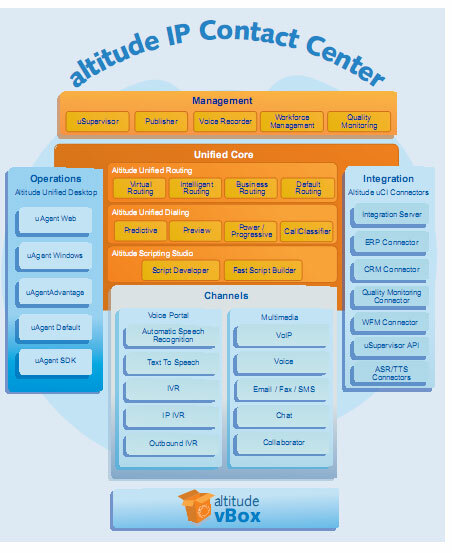 Altitude uCI™ (Unified Customer Interaction) is an IP based, unified but modular contact center management solution, which powers your people to new levels of productivity, speeds up deployment of new services and campaigns, and all within a single system to license, learn and operate. Altitude uCI™ was designed to speed up your operations, while simplifying the management of contact center complexity, since it increases productivity, reduces operational efforts, and, ultimately, raise customer satisfaction levels. As the name says, Altitude uCI™ unifies the management of all interactions, from begin to end, regardless of the channel that the customer chooses to contact your company - Voice, VoIP, Email, SMS/MMS, Fax, Messaging or Web. The mobile phone becomes the only media to communicate between human with voice, text & video, Short Messaging Service or so called (SMS) the text messaging media has change our life style and make it easier to communicate with our loved persons, even for business SMS is used to update, inform, protect & communicate with the customers in order to post them with everything happen with the organization. Our solutions & service can go beyond all of that depend on how the customer would like to implmement the system, the system is capable to send 1 message per minute and can go upto 1,000 messages per second a carrier level SMS Gateway software. The SMS Gateway solution can be easily integrated with Altitude Contact Center and help the agent to communicate efficiently with the customers. Effective corporate governance cannot be achieved without the implementation of a sound enterprise risk management strategy and supporting system. A risk management strategy that ensures compliance with the prescriptive measures that govern and control the market, credit, business operations and legislative landscape is a critical business value driver. Such a strategy also ensures compliance with the punitive measures imposed by legislation and industry regulations. Many businesses, especially in the financial sector, are required to record and store transactions and client interactions for compliance, archiving and verification purposes. Non-compliance with Acts such as RICA, FICA, FAIS, the NCA and international compliance policies such as Sarbanes-Oxley (SOX) and Basel II, can have serious implications. KTC offers an enterprise-wide voice and screen recording, analysis and archiving platform that can provide the functionality needed to proactively control risk and minimize growing litigation costs. Companies that wish to mitigate the risks associated with financing, credit provision and reputation management, among others, realize the invaluable contribution that the combination of voice and screen recording technology can make. This also applies to industries where the contents of the conversation could have legal implications (health advice, emergency response actions, even air traffic control instructions). Because these institutions frequently manage highly sensitive data, our products offer robust and secure voice and screen recording solutions that can capture and store every critical interaction that takes place, no matter the size of the organization, technical environment or business need. KTC offers Fax Server & Automated Fax solution for business, our solutions delivers secure, fast and cost effective document distribution. Simple to install, easy to manage and highly reliable, our products from Equisys has a proven track record in providing businesses with complete fax solutions that generate real cost savings whilst streamlining their business processes. This is why Zetafax is the proven choice of fax server for over 60,000 customers worldwide. Reduction in costs associated with document delivery. Fax over Internet Protocol (FoIP). Increased efficiency through integrated faxing from existing applications. Quick retrieval of documents through automatic fax archiving. Improved productivity through automation of costly manual processes.